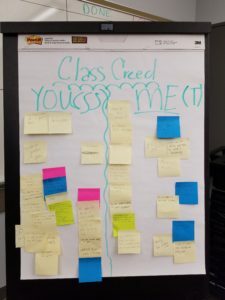 This post was written by Theresa Moore, Ph.D., Faculty Development Specialist at KCELT. Every semester I spend a bulk of the first week of classes building community – not focused on content. This practice helps me to connect with students and build trust between me and them and among each other. I encourage every faculty member to take time to get to know their students and build community while the semester is new. Take time to laugh with them. Be sure to contact anyone at KCELT to get started on co-designing some great activities for your classroom. I received my Ph.D. in Education with an emphasis in Teaching and Learning from the University of California, Santa Barbara and I am proud to say that I have several years of experience in faculty development, team leadership, and classroom teaching. Thanks for sharing! I find it so helpful when specific examples are shared as to how to connect with students instead of just stating that connecting with students is important. I like this idea! Thanks, Christi! I am always happy to share and encourage all faculty to do the same so that we can learn from each other. We can all grow from each others’ strengths, for sure. 🙂 If you try this technique out in a class, please let me know how it goes!